The band’s name is often abbreviated as JOP. The band is also known as ‘The Jon Olivia Project’. The group is the latest project of the co-founder of Savatage Jon Olivia and was formed somewhere around 2003. The early days saw Jon Olivia recording various solo songs for the formed band although several months later he was joined by the former members of ‘Circle II Circle’. People saw the band’s first live gig performance at Criss Oliva Memorial Concert in 2003. The band’s debut album ‘Tage Mahal’ was released in 2004 through SPV records label. Their second album titled ‘Maniacal Renderings’ peaked at #86 position on Germany’s Media control chart. Jon Olivia’s Pain released their latest album in the year 2010 which was titled as ‘Festival’ through AFM label. The album also reached #87 on Germany’s Media control chart. The band also came up with an EP titled ‘Straight Jacket Memoirs’ in the year 2006. 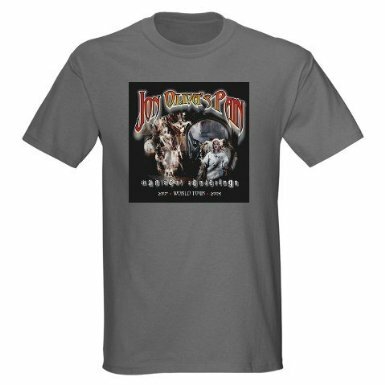 OOPS, sorry but there does not appear to be any "Jon Oliva's Pain shirt" items on eBay at the moment.